TC-2300B DAB/DMB Tester supports the Eureka-147 (ESTI EN 301 500) system, freely changes every parameter related to protocols in a GUI operating system and simultaneously generates almost unlimited pattern signals. In addition, it includes an RF up-converter, which supports RF output in a range between 0 ~ -120 dBm and Band II, III, L frequency ranges, so it can directly generate broadcasting signals to DUTs so that systems can be easily aligned. TC-2300B DAB/DMB Tester supports the Eureka-147 (ESTI EN 301 500) system, freely changes every parameter related to protocols in a GUI operating system and simultaneously generates almost unlimited pattern signals. In addition, it includes an RF up-converter, which supports RF output in a range between 0 ~ -120 dBm and Band II, III, L frequency ranges, so it can directly generate broadcasting signals to DUTs so that systems can be easily aligned. TC-2300B can be used through its audio analyzing function that analyzes signals from earphones or a receiver speaker in tests of receiver audio quality or reception sensitivity. TC-2300B, developed by our own technology, by various functional aspects such as 1 Hz step frequency, 0.1 dB step output of stabilized RF performance and many other functions, offers the most ideal solution in DAB/DMB receiver development, production and service. Previous measuring systems had many inconveniences in operation, installation, and maintenance. They took up a large amount of space and were separately formed by a pattern generator that produces protocol signals, an RF up-converter that converts other signals into RF type signals and an OFDM modulator generating OFDM signals. However, TC-2300B offers a combination test system that is economic and convenient, offering solutions to these problems. The BER test method is commonly used to evaluate whether DUTs receive signals correctly in sensitivity tests or adjacent channel tests. However, it is not easy for DAB/DMB since they are based on half duplex communication. Therefore, TC-2300B is equipped with an audio analyzer function for easy access in the measuring process. While a 1 kHz audio tone from TC-2300B is sounding through the DAB channel, the audio output from a DUT is examined through an audio analyzer of TC-2300B. This enables DUT normal operation status test and audio properties like THD and SINAD to be measured simultaneously. By using this function, easy application of other manufacturing lines without other test modes or related equipment is made possible. The DAB/DMB audio broadcasting signal consists of analog and digital converting processes. An analog audio signal is digitalized first and then it is archived by MPEG2 to be sent to DUTs. Then, a DUT that receives the digital signal extracts archived data and the received data is outputted through a speaker of a DUT. If there are too many errors during data transmission, there will be cracks in the audio signal. Therefore, if a single audio analyzer measures SINAD and distortion, there is the possibility of losing the partial crack of audio signal phenomenon. Therefore, TC-2300B is equipped with a Continuous Mode Audio Analyzer function in order to prevent this problem. In this mode, an audio signal is continually analyzed for a set time period and the status of the partial loss of a signal is displayed as a number. When previous audio analyzing methods and Continuous Mode analyzing are used together, the ideal measuring environment is created for digital signals such as DAB/DMB. Previous systems such as a pattern generator had to use a broadcasting pattern (ETI file) produced by another PC-program after a download. If there is a protocol test, then related variables should always be of concern. However, changing variables requires regeneration of a pattern by using a computer, and a download process is required every single time it happens. TC-2300B is equipped with an ensemble multiplexer so that there is a very convenient working environment for changing variables. A protocol test is also included; protocol variables can be changed using an internal GUI program and an applied signal is produced and transmitted in real-time following the change. TC-2300B supports high-tech protocol tests such as Reconfiguration, Announcement and TII. While the broadcast is occurring, reconfiguration notifies DUTs in the receiving process of any important signal changes such as MCI (Multiplex Configuration Information). Therefore, synchronization between TC-2300B and DUTs is sustained even if the variable is changed in the middle of a process. In order to obtain this function, both current and future MCI related variables are used to ensure proper communication. TC-2300B offers a setup screen on which the user can change variables for the reconfiguration function. Announcement is a function for a compulsory situation or automation functions. For example, if there is an emergency situation, then an announcement function is activated. This function changes the channel for every listener so that they can hear the emergency message or announcement.. Alternatively, it can also be used by the user to set the channel to change to a specific program at a specific time. TC-2300B offers a screen that the user can use to change the announcement function, and it transmits announcement related FIG for compulsive channel changing. TII (Transmitter Identification Information) appoints an ID to every transmitter and transmits it through Null space, which is sent for every frame for various applications such as current location checking. TII can be on or off on TC-2300B. Additionally, the ID is changeable and double ID transmission is available. If two IDs are transmitted, the operation environment is also changed as if two transmitters were working at the same time. TC-2300B enables the Service Component to be set to be in a packet mode and its related variable is also changeable for packet mode measuring. This mode is used for many functions such as BWS, TPEG and EPG. When there is an application test using a packet mode of TC-2300B, a coded file should be downloaded into the internal memory of TC-2300B. Alternatively, real-time data transmission into TC-2300B is also possible through a connection with a personal computer. For measurement of performance of a DUT, BER measurement is essential. For this, TC-2300B offers a function that fixed pattern data is transmitted into the data channel. In order to measure BER, the BER measuring test mode of the DUT is needed. For easy BER measuring, set DUT to receive a certain type of fixed pattern data and show ‘bit error’ if the received information is not equivalent to the fixed pattern data. Therefore, if BER test mode is set to DUTs and it is applied to a mass-production line, there is high productivity and more accurate measuring is possible. The ETI file describes the characteristics of a signal suitable for transporting a full DAB Ensemble, comprising a number of sub-channels and a formatted Fast Information Channel (FIC), between the DAB Ensemble provider and the Transmission network provider. It means that if the ETI file is recorded specific broadcasting station’s DAB/DMB signal, it contains all information about that station’s. Using this file with the TC2300A/B’s ETI function, that specific broadcasting station’s DAB/DMB signal could be regenerated in the LAB. The function test is, according to specific rules, simple judgment by the eyes alone is unlikely to measure specific details about the performance of a DUT. This method was developed as a final quality check for factories or for a temporary check. In this method, the antenna is connected to the RF output to transmit an audio or a video sample stored in the internal memory to DUTs at maximum power to evaluate how DUTs receive the data. Regardless of how many DUTs there are and without any other test equipment, only one TC-2300B is necessary to perform this test. The Receiving Sensitivity Test is the most important test because losing receiving Sensitivity means a lack of receiving performance in real environments. Generally, the test method is a transmitter sending data at a low level and DUTs receive the data. Subsequently, receiving sensitivity performance is judged by examining the purity of the test-received data. 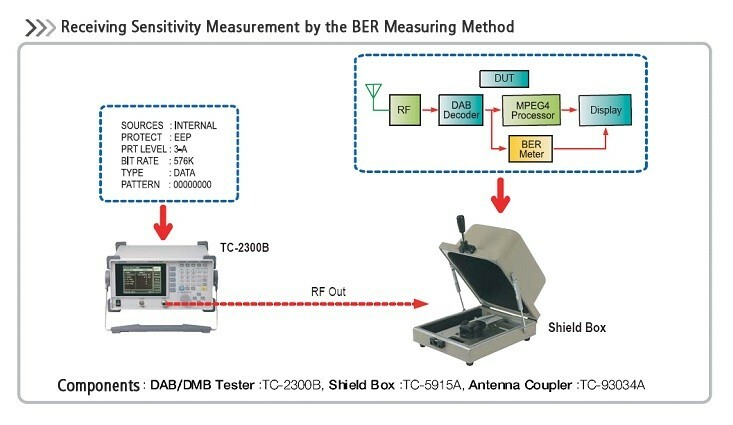 According to the European Standard EN50248 Characteristics of DAB receivers, which defines standards of DAB receiver performance, when -81 dBm level of signal is received, the BER test result should be over 10-4 However, it is known that the level of signal should be over -96 dBm. In building receiving sensitivity environments, as well as eliminating obstacles, which are harmful to signal activity, and choosing methods like BER, accurate path loss from a signal generator and a receiver should be considered as an important mater. It is also essential that DUTs are properly setup for the test method. TESCOM offers various types of antenna couplers, TEM Cells and shielding equipment. Using those items, customers can solve connection and shielding problems. In addition, accurate measurement is guaranteed since the same connection and shielding environment eventually produce such a regular path loss. For BER test, the prominent method in performance test of a receiver, TC-2300B supports a function of a fixed pattern transmission or PRBS through a data channel. For the BER method, at a receiver, the front and rear sides of Viterbi decoder should have a function to check BER. If one does not have such a function, the BER test is also possible through the audio performance measurement method that TESCOM proposes. The method is to transmit an audio tone from TC-2300B to the earphones of a DUT. The audio tone from the earphones of a DUT comes back into internal audio analyzer of TC-2300B to judge receiving performance by measuring SINAD and THD. This method has already been demonstrated to be accurate by many companies and also detects inferiority of the receiver’s audio I/O. Adjacent channel measuring is to measure how a receiver is influenced from inference of a adjacent channel. Thus, two signal sources are required for such measurement. Therefore, two TC-2300Bs or connecting general IQ signal generators at the IQ port of TC-2300B is required. The measurement method is to set the wanted signal to -70 dBm and the interfere signal to -40 dBm, which differs 30 dB from the wanted signal. Then, transmit signals from both sides to observe how accurately a receiver receives the wanted signal. Simultaneously, make sure that the receiving status is more than 10-4 by BER measurement. At the output of an adjacent channel, the sensitivity of an adjacent channel should be about 30dB, which is the minus value of the wanted signal. The European Standard EN50248 defines the requirement of Adjacent Channel selectivity as grater than 30 dB but usually 36 dB is used. Similar to the receiving sensitivity method required, an adjacent channel measurement should also have a path loss, shielding condition. Additionally, audio testing can be done instead of BER testing.